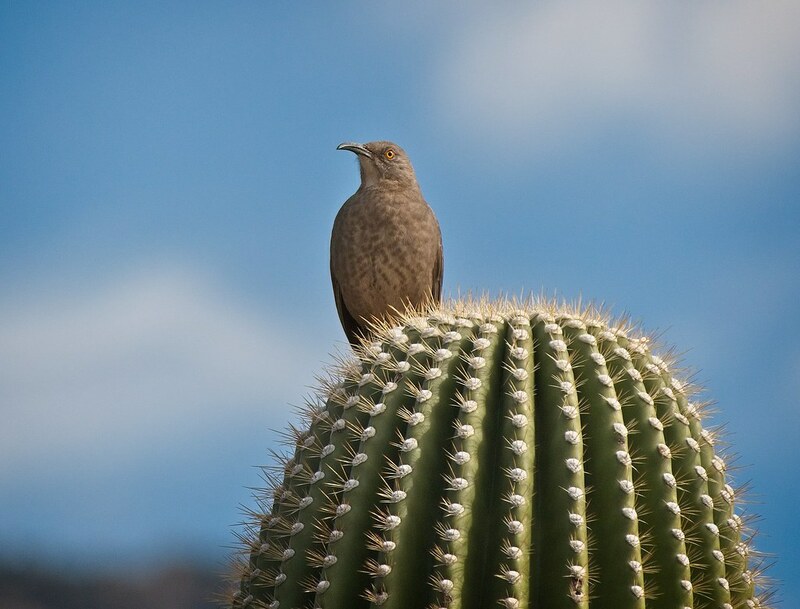 I recently took a trip to the Sonoran Desert in Arizona, which is pretty much the opposite of Manhattan - arid, intense sun, huge sky, open spaces, alien vegetation and unique wildlife. 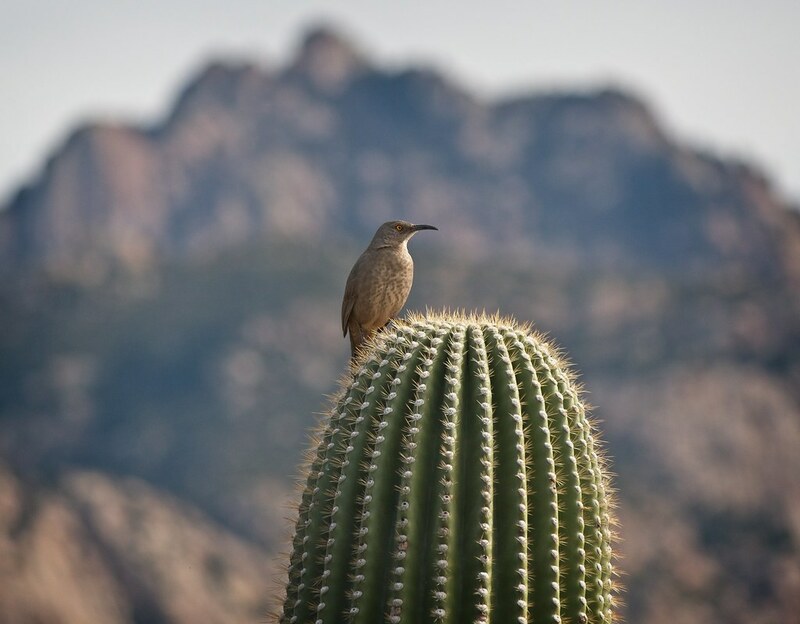 Catalina State Park, 17 miles north of Tucson, is a great place to experience all of these things. Below are a few of my favorite birds seen in the area. This bird has a stunning orange eye. The Thrasher looks lovely posing with the Catalina Mountains in the background. 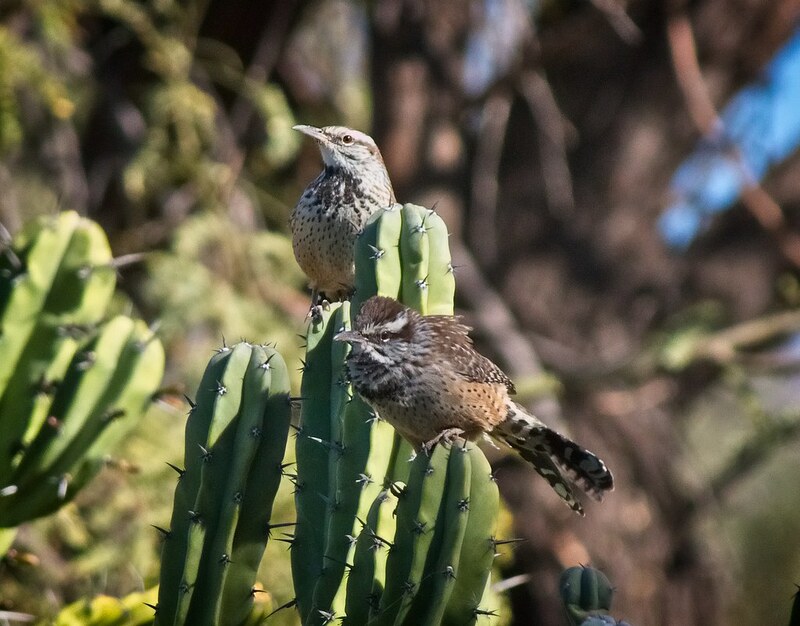 I enjoyed many encounters with cactus wrens, and they were most identifiable by their vocalizations. Their markings are really beautiful. 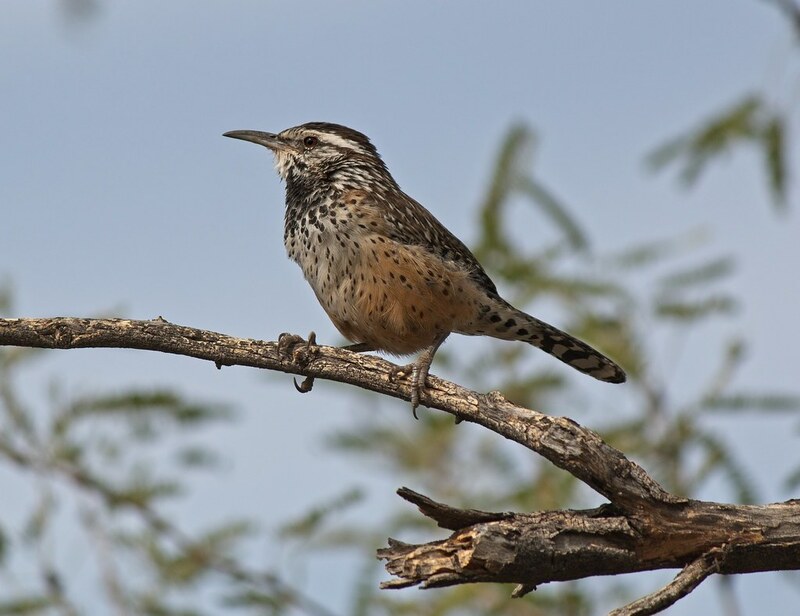 I was happy to learn the Cactus Wren is the state bird of Arizona. 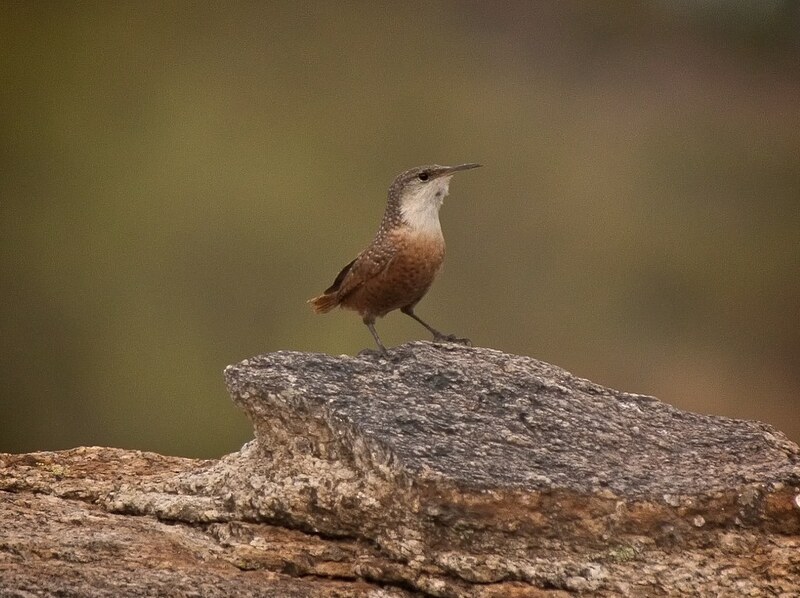 This was the first time I'd seen a Canyon Wren. 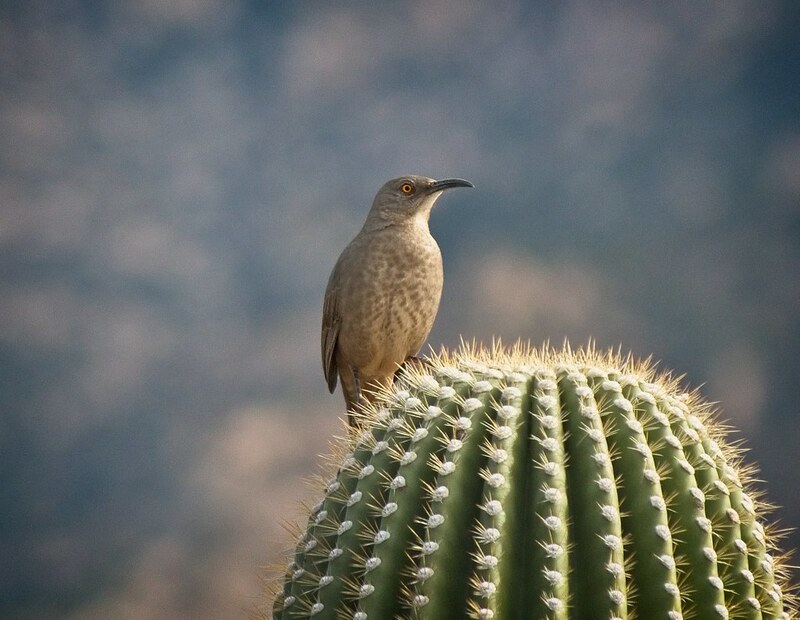 Like the Cactus Wren, this bird drew my attention with its song. 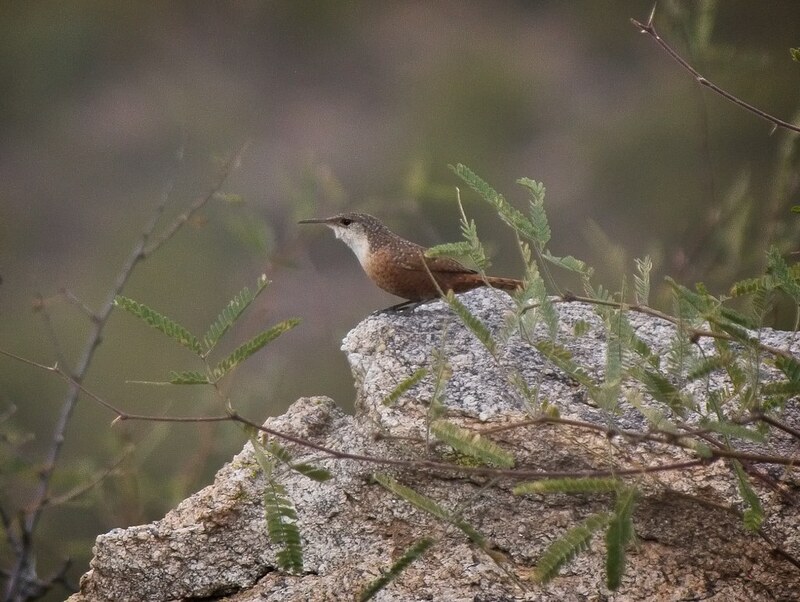 Hummingbirds were everywhere and they could be heard much easier than they could be seen. I found this was true for almost all of the birds I saw. Despite the sparse vegetation and bright sunlight, wildlife was surprisingly tricky to see. 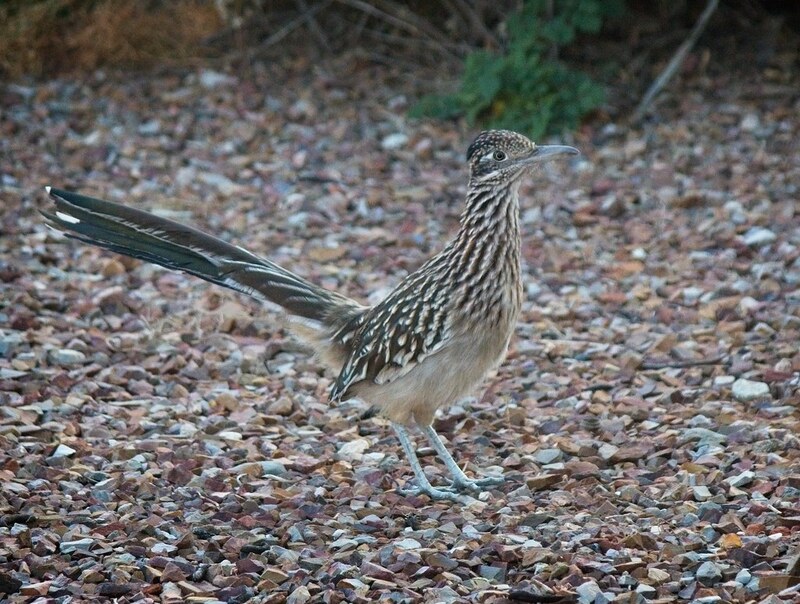 Just as I was complaining that I hadn't seen one, a Roadrunner came walking by. To me, they look prehistoric. 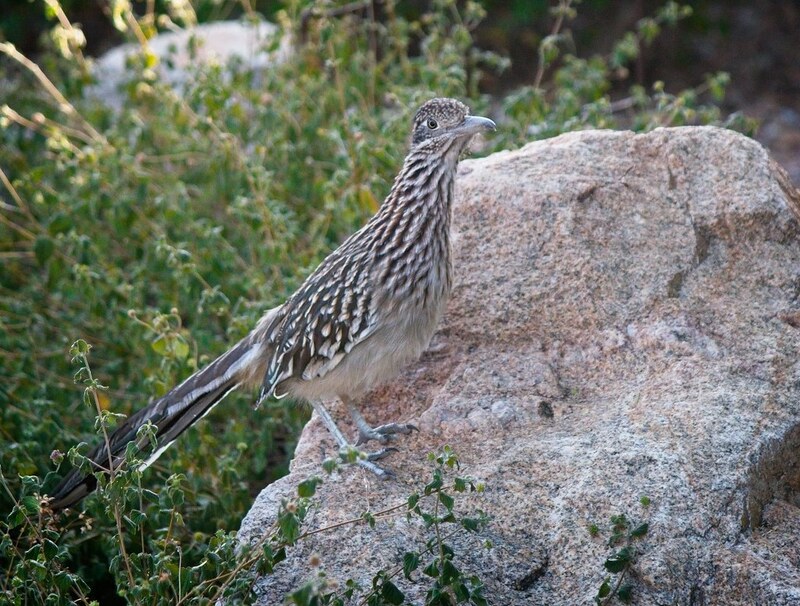 The Roadrunner is a really colorful bird, especially its rainbow tail. 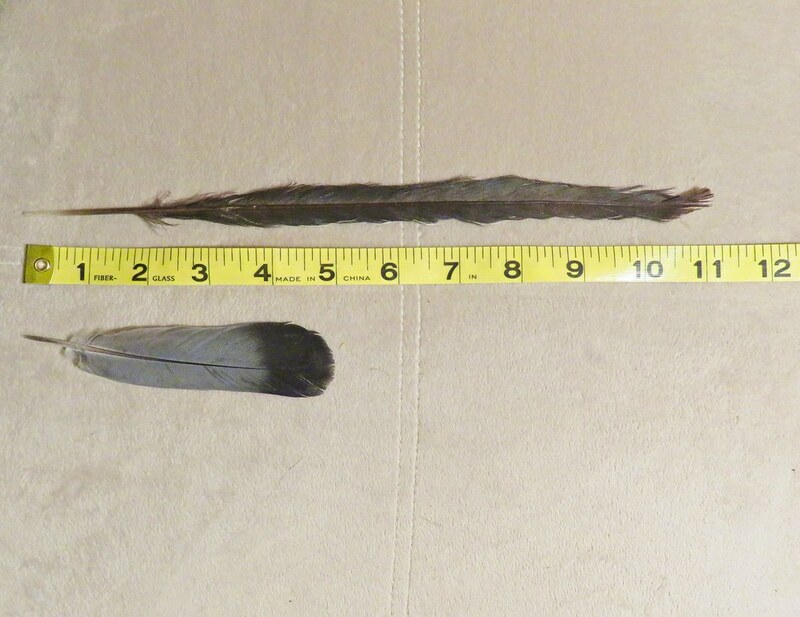 My companion found a tail feather on one of the hiking trails. 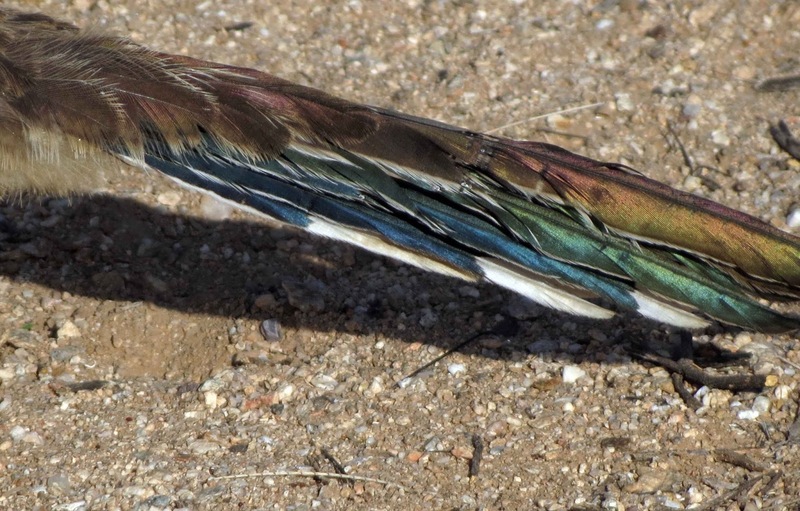 It's brown with an emerald green sheen and can be seen below with a pigeon tail feather for reference. 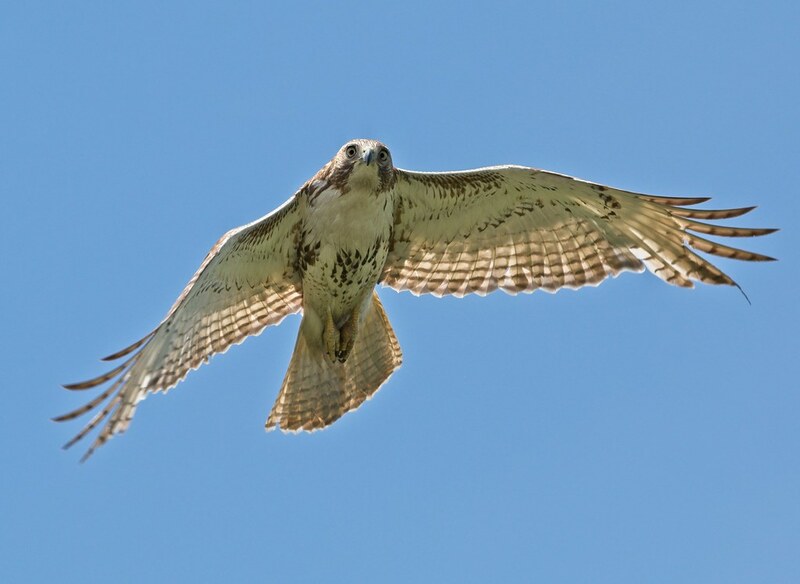 A birding trip would not be complete without a Red-Tailed hawk, and this one obliged by flying close overhead. I was struck by the amount of color on this hawk and the barring pattern across the body. Below is a photo of Christo for comparison. He has a lot more white on him, while the desert hawk shows much more brown. 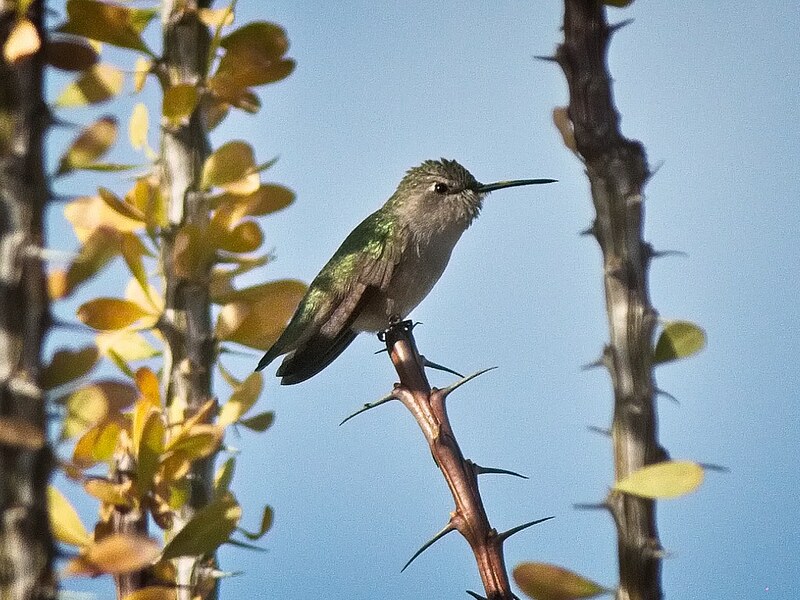 You can see more Arizona birds on my Flickr page. 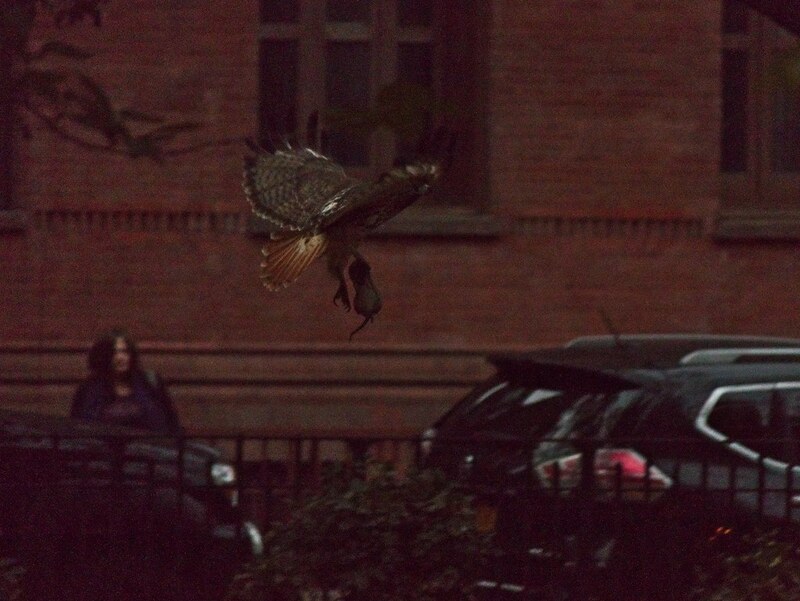 Saturday was dark and drizzly in Tompkins Square, but both hawks were keeping busy in the park. I first caught up with Christo, who was calmly perched behind the park offices, watching rats run around in the bushes. Not happy with the dinner selection in that area, he took off to the front side of the offices. Christo is so quick, I was still in the covered area when I saw him swoop low to the ground and nab a rat from in front of the women's restroom. The action took about half a second and I missed the grab. I did manage to catch Christo with some lovely fall foliage, though. Christo took the rat to the east side of the park where he ate it in less than five minutes. Dora had been watching him, so I expected him to share with her, but he ate it all himself. After Christo dined and dashed, Dora came around and seemed to be in hunting mode. I've only seen her catch prey in the park two or three times in the last four years. This doesn't mean she doesn't hunt there, but she is more secretive about it. The last time I saw her catch prey, she was pretty badass. On this day, since I'd already seen Christo do his thing, I decided to hang out with Dora. As it was dark and raining, sitting with her was a bit tedious, but she kept acting like she was going to pounce on something, so I stuck it out. 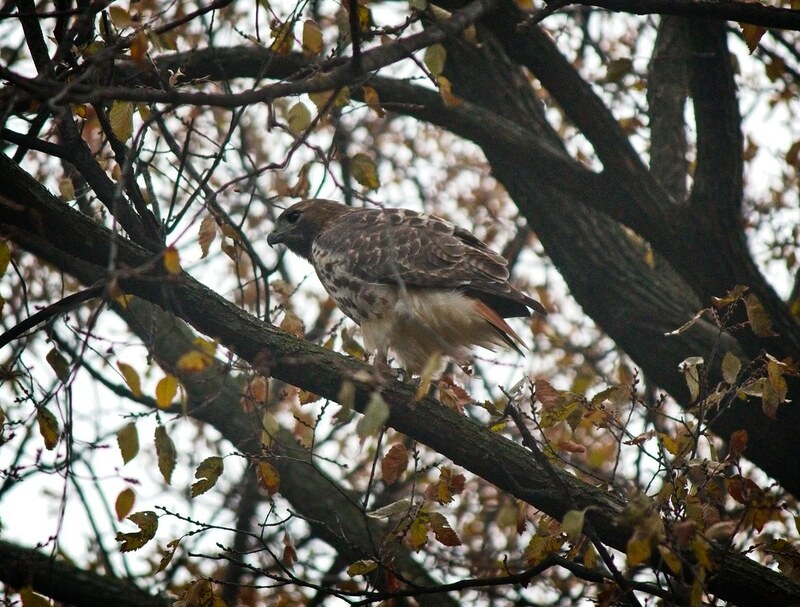 After about an hour of watching her sit stand sit stand sit stand on the same branch, Dora finally and suddenly dove down to some bushes near the 9th St and Ave B entrance to the park. When she popped up, she had a huge rat in her talons. The photo below shows how dark it was. Dora took her catch to a favorite feeding branch along Ave B to eat in privacy. She discarded one part of the rat - possibly the stomach. I've seen Christo discard this particular part before, and I've wondered if the hawks do this for a reason as they seem to eat all other prey parts including bones, tails, feet and feathers. Meanwhile, the hawks have been working on the new nest in the old ginkgo tree near the 8th St and Ave B entrance to the park. 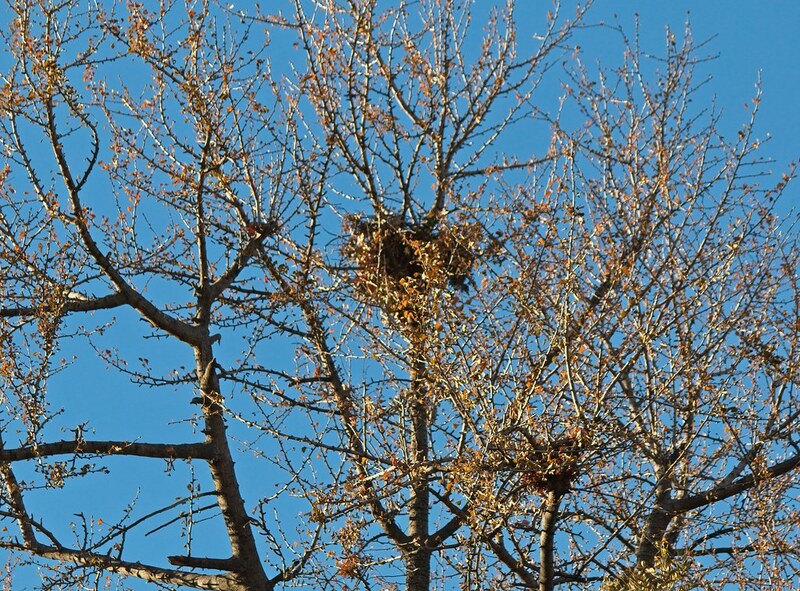 In the photo below, the nest is the large blob in the upper part of the tree. 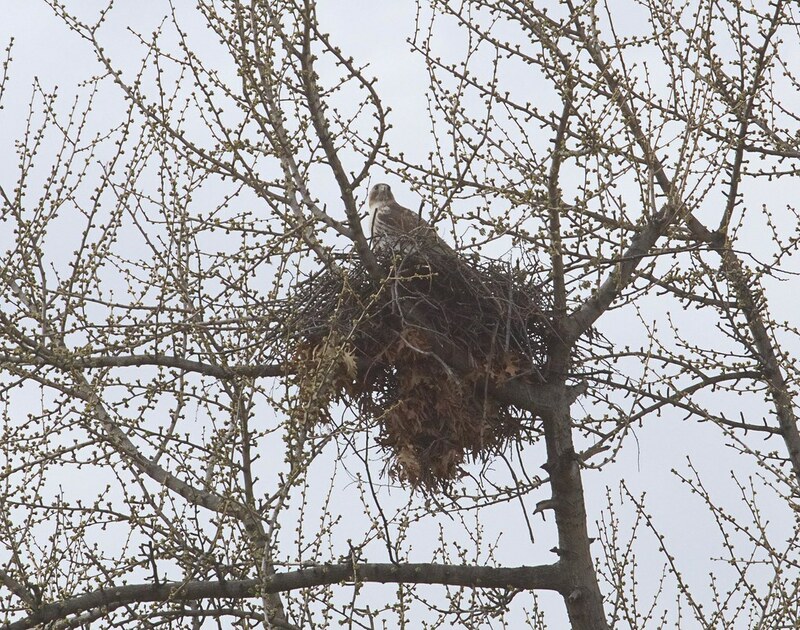 This photo from April 2016 shows the location of the previous nest in the same tree. It was in the crook of the trunk to the left. The 2017 nest in the locust near the Temperance Fountain is still holding together. This is not hawk-related, but I saw that Anton van Dalen was flying his pigeons Friday afternoon over the skateboard area at Ave A and 10th St. I love to stand and watch their soothing circles in the sky. 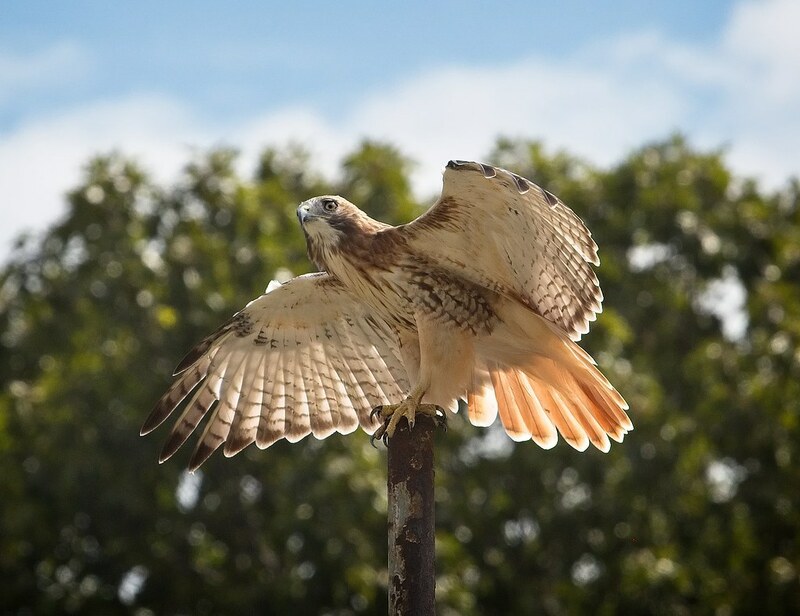 I saved my favorite for the final 2017 Governors Island wildlife post: hawks! 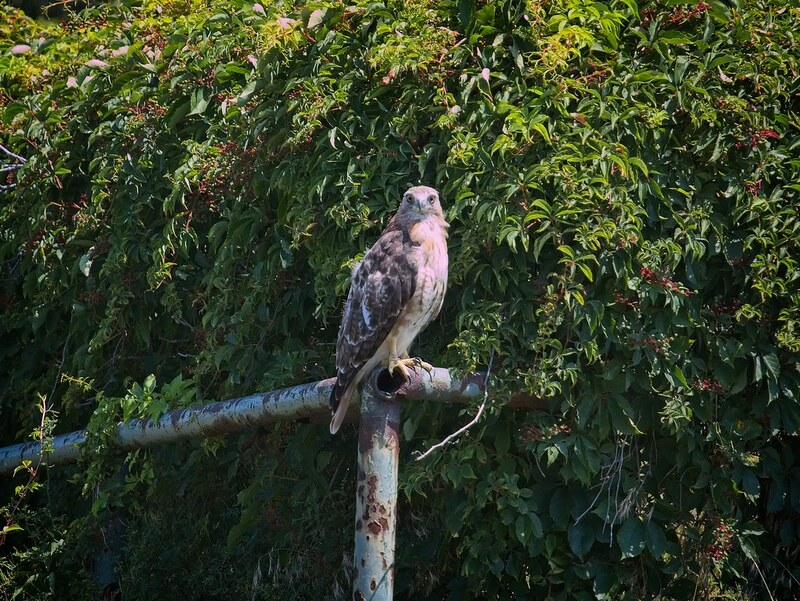 While East Village red-tails Christo and Dora were busy raising a family in Tompkins Square this last summer, a couple of other hawks were working hard to maintain a territory on Governors Island. 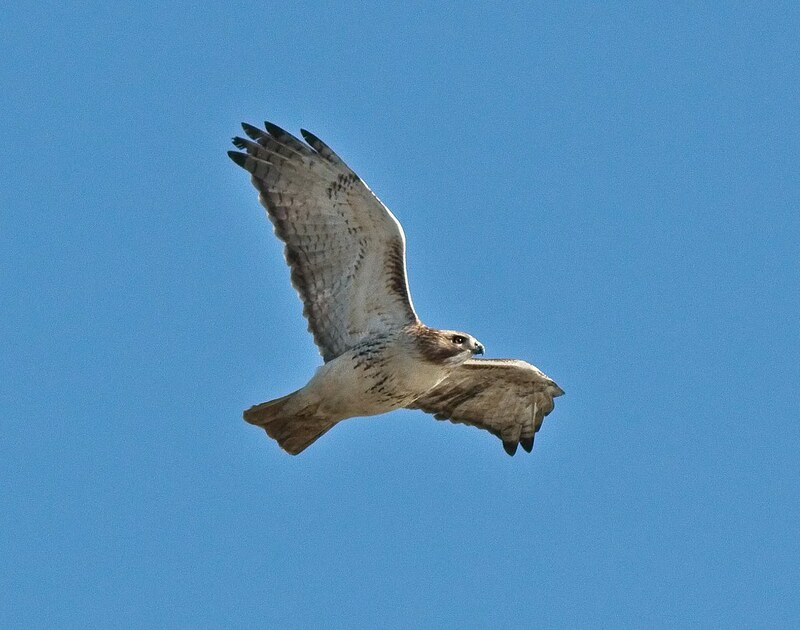 I don't know if this is an official red-tailed hawk pair, but there were two individuals on the island all summer. One was an adult and the other began the season as an immature. Here it is on May 4 - note the barred tail and the light eye color. 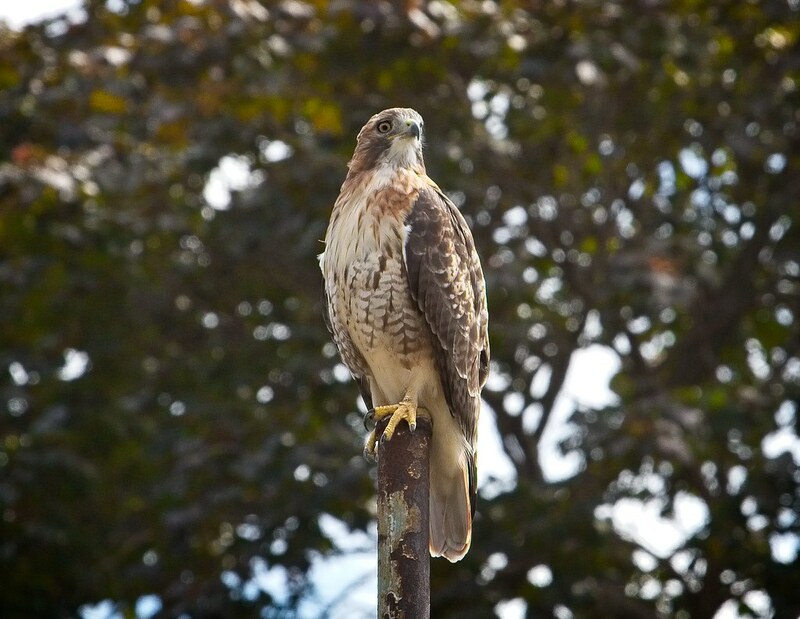 Governors Island has a few wide open spaces surrounded by tall trees, which is a nice environment for a hawk. The island paradise comes with a downside: competition. Several fish crows and a lot of gulls nested on the island over the summer, and none of them were happy to have hawks around. I've posted this photo before, but I like it because it shows three different species (fish crow, red-tail and herring gull) in the same shot. 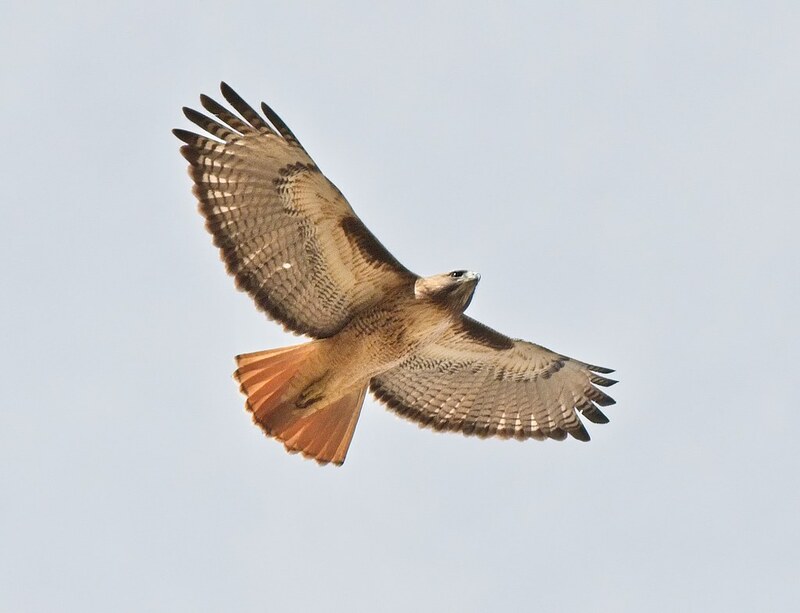 The red-tails were regularly mobbed by the other birds. 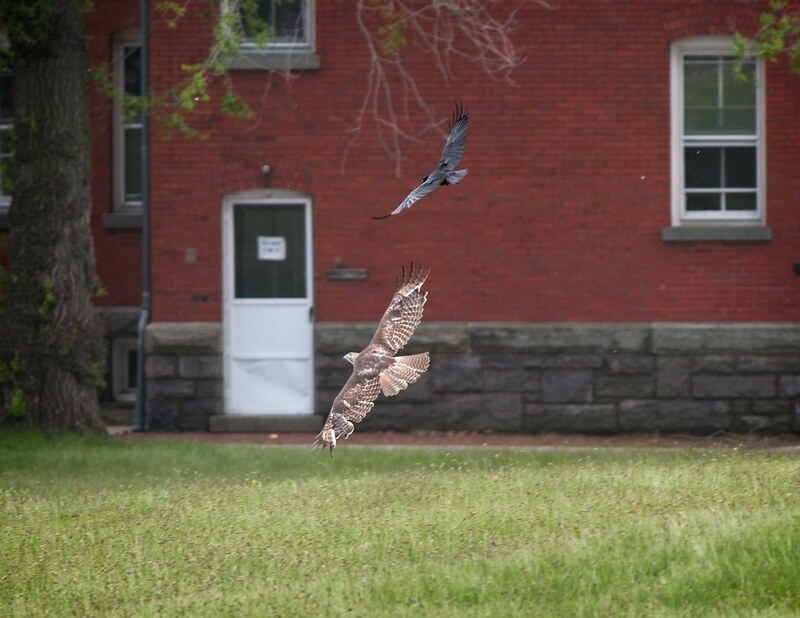 As is seen here with a fish crow chasing the immature hawk across the Parade Ground around Fort Jay. At the time, there was a crow nest near the fort. 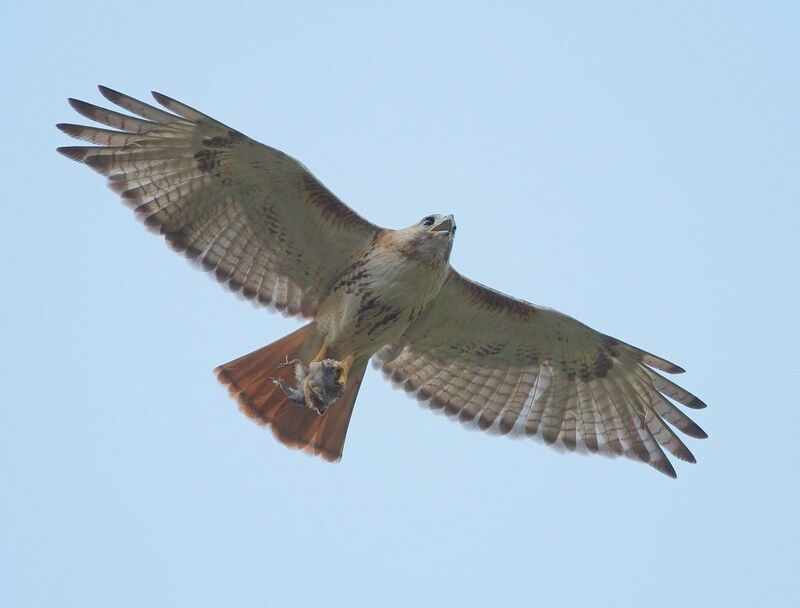 ...and grew in an adult red tail. 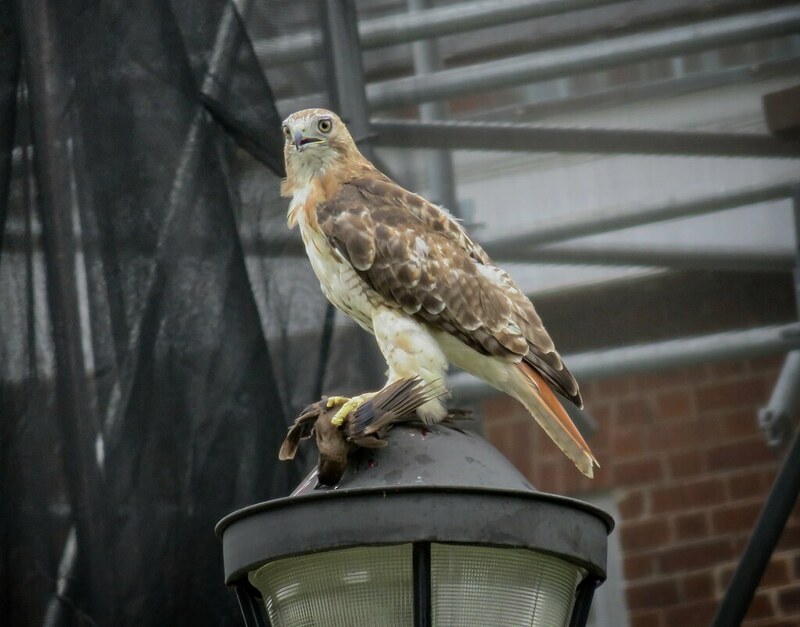 I've been so spoiled watching our Tompkins Square hawks so easily, it was much more challenging to keep tabs on the Governors Island hawks. 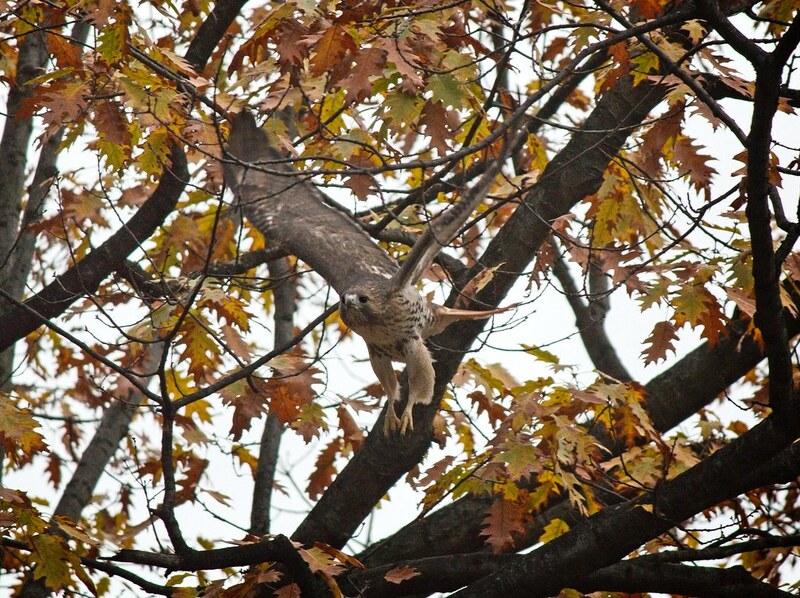 I couldn't figure out what they were eating until I saw the young light-eyed hawk catch an immature starling. Pigeons are kind of rare on Governors Island, but starlings and mourning doves were in abundance. I only saw one rat the whole summer, but people who work on the island tell me rats are present. 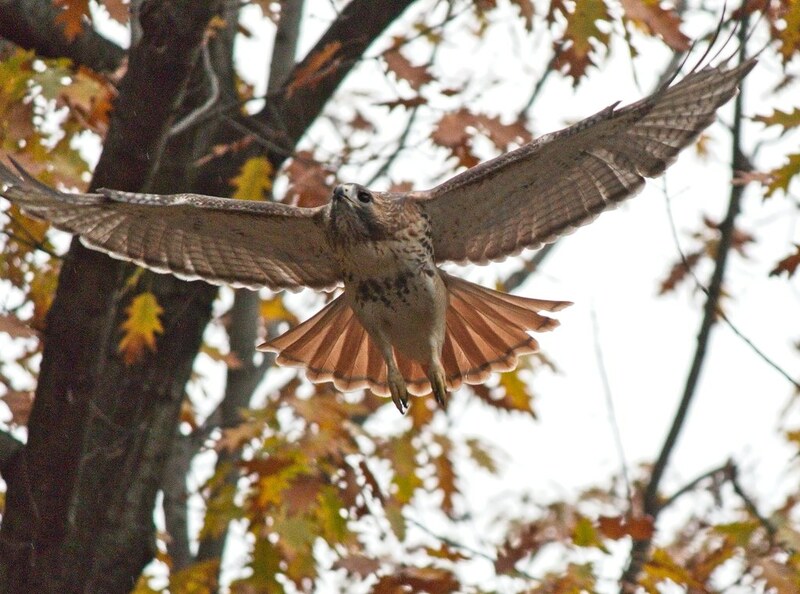 The hawks were also observed catching squirrels. The young light-eyed hawk was the one I saw the most often, although both hawks were seen perched together several times. 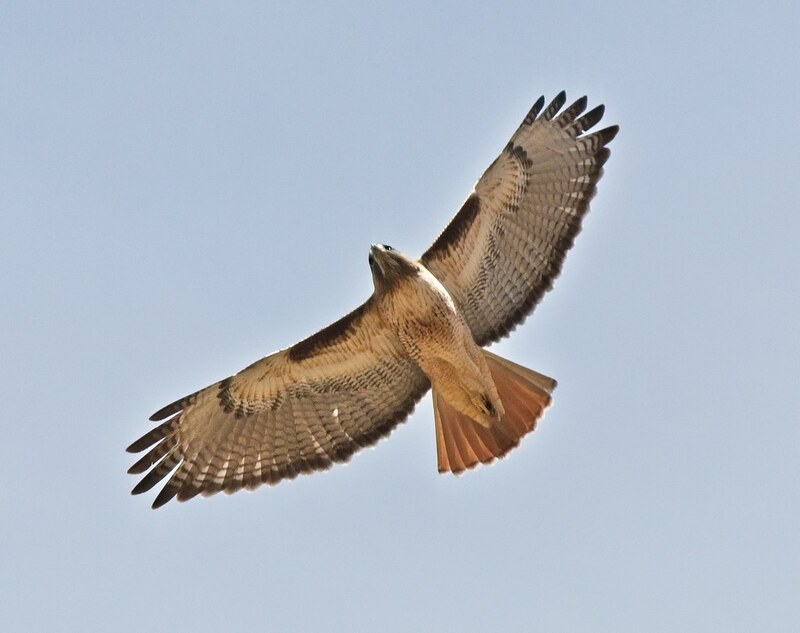 To compare the two, the light-eyed hawk is below. Note the golden head color, light belly band and small amounts of brown in the wings. 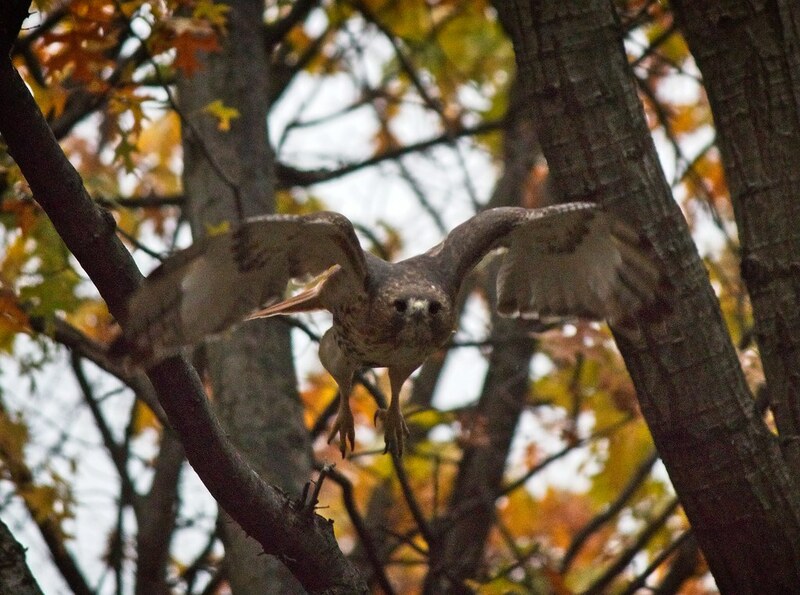 This is the other, dark-eyed hawk. Note the dark head, bright white chest and more brown in the wings. This one also has a really interesting voice - its call is so hoarse, it sounds like someone who's had too many cigarettes and bourbon. Unfortunately, I was never able to get a recording of this unique voice. The hawks were often pestered by kestrels. Below, the light-eyed hawk takes refuge on a ledge as the shadow of a kestrel looms. 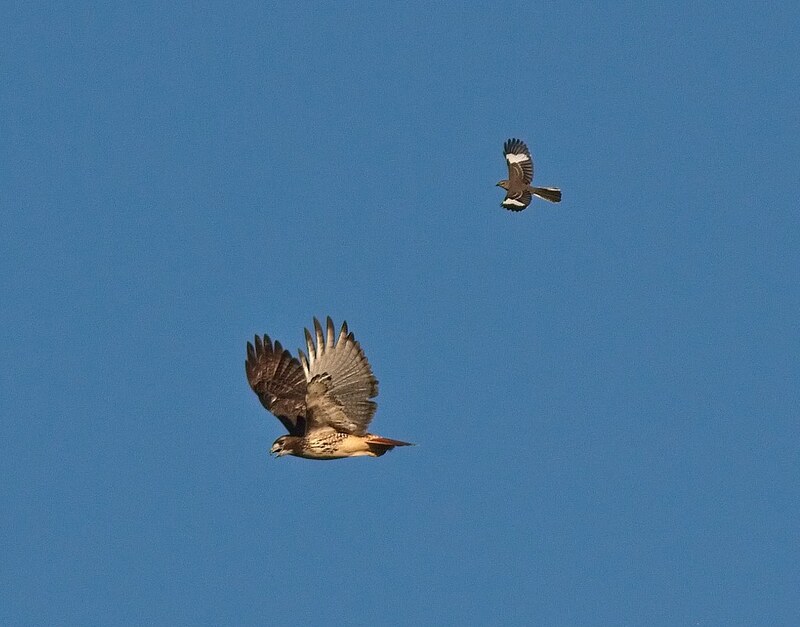 This was a typical scene - a hawk perched with a kestrel zipping around. 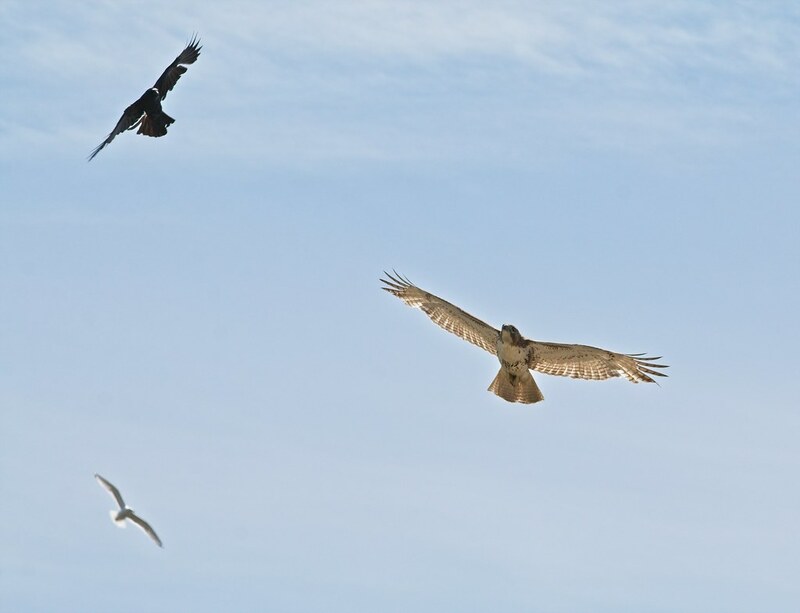 Below, a mockingbird chases the dark-eyed hawk. Cooper's hawks were present on the island, and I loved to watch them chase murmurations of starlings. The open sky of Governors Island is great for observing this behavior. 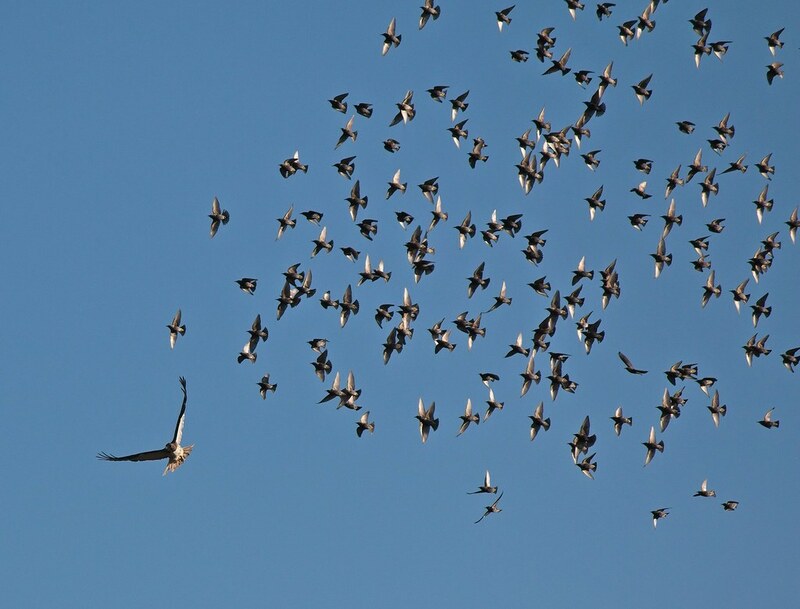 When ever a flock of starlings took to the sky, there was a good chance a hawk might be in the mix. Below, a Cooper's goes after a flock. 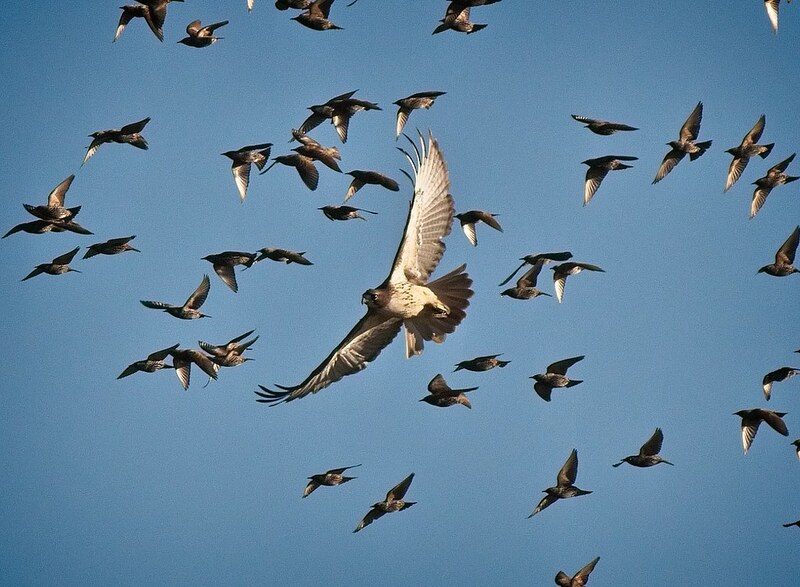 The hawk would shepherd the starlings into a tight group, then force them down and take one out. When the Cooper's got the starlings riled up, the red-tails would often take advantage. 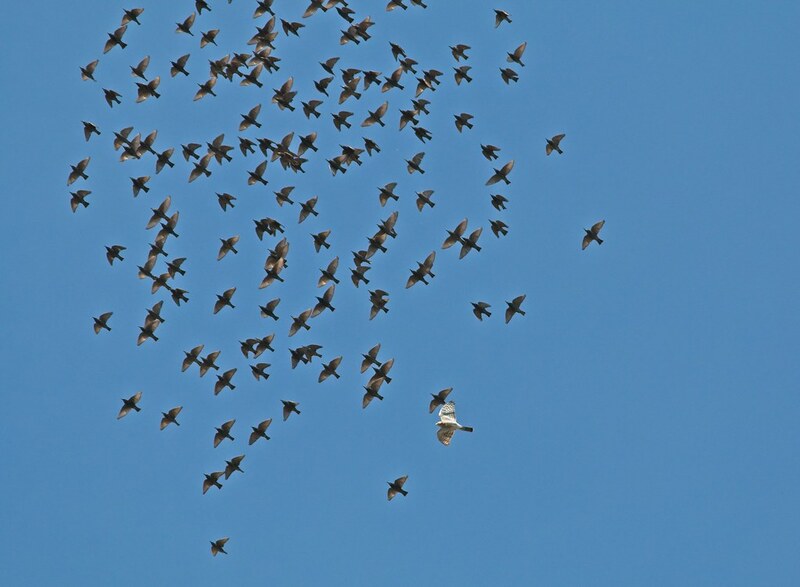 Below, the dark-eyed red-tail joins the same flock of starlings after the Cooper's took its prey. I'm hoping this pair of red-tails remains on the island and decides to nest there. We will have to wait until next season to find out. 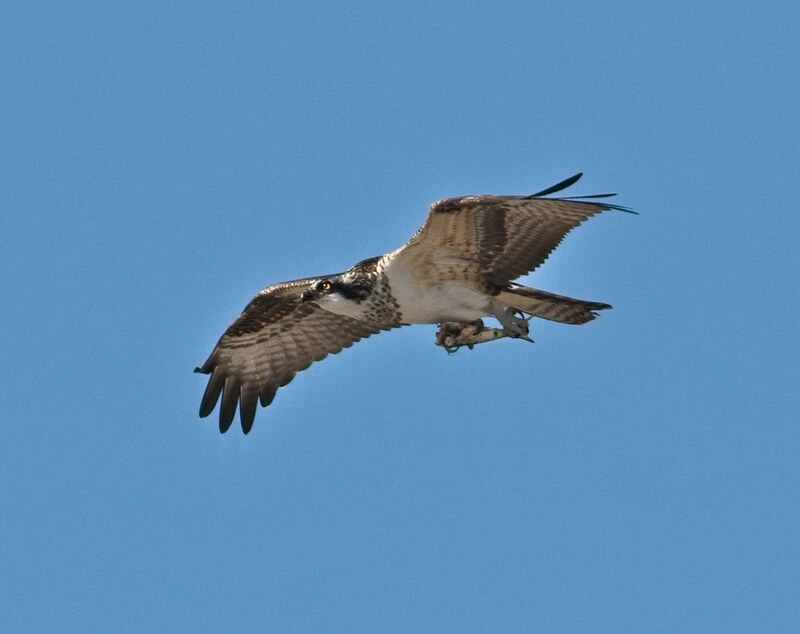 This is not a hawk, but still worth noting - an osprey with a fish. I'm not sure where it caught the fish, but I took this photo on the south side of the island near Picnic Point on October 18. The osprey was flying from Buttermilk Channel and was headed west. I never saw it land, so I don't know where it enjoyed its lunch. The island was open through the end of October this year, so I made sure to be there on the last day, which was Halloween. 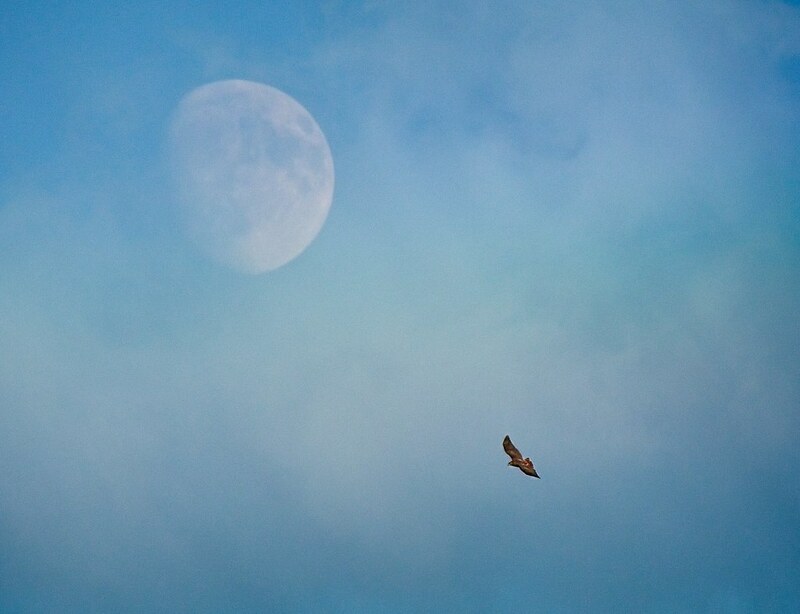 As the sun set and the moon rose, I caught my last glimpse of the dark-eyed red-tail as it sailed over the Parade Ground. And, while reluctantly heading for the last ferry back to Manhattan, I was lucky to catch this last shot of a Cooper's hawk chasing a pigeon across the ferry landing. It was a great way to end the season. 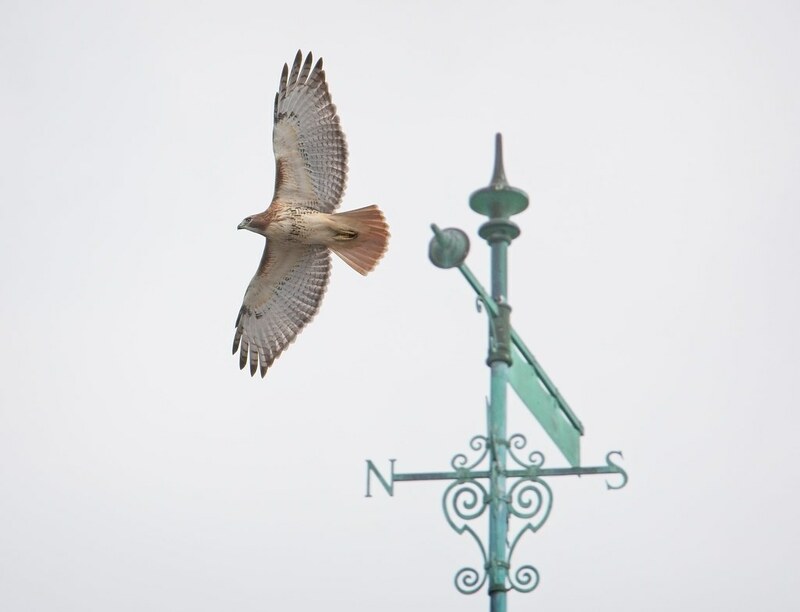 To see more photos of the hawks on Governors Island, see my Flickr page. I've also been keeping a running photographic record of Governors Island here. This is an ongoing project. 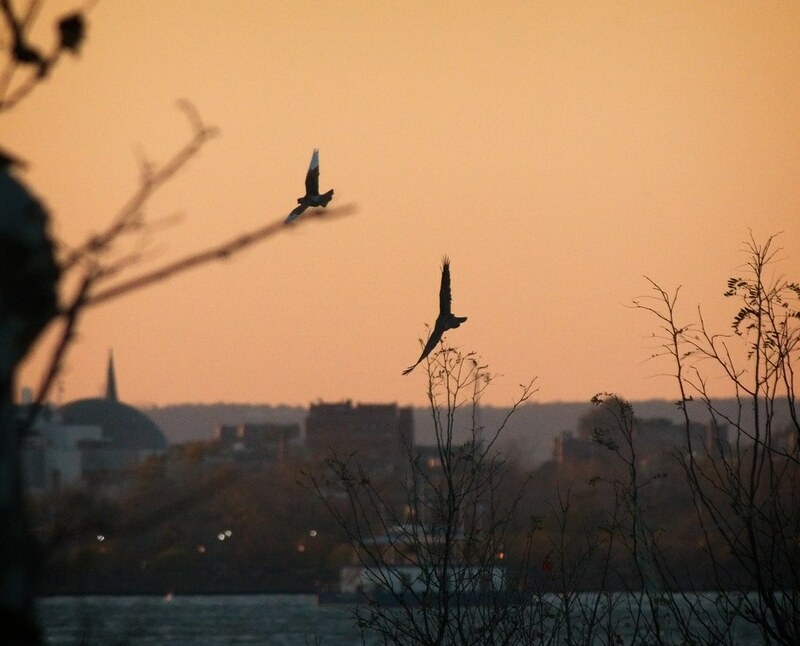 For information about all the birds documented on Governors Island, check out the collection of data on eBird, which is a citizen science project run by Cornell University. 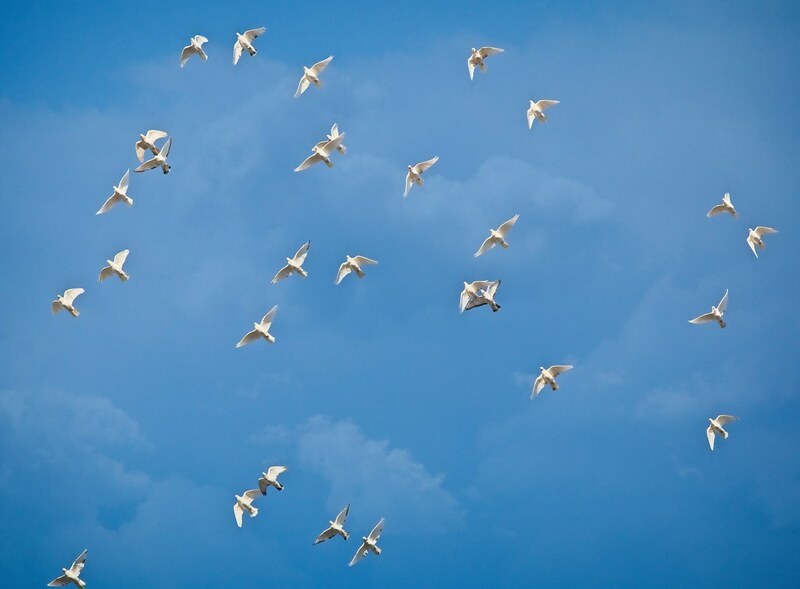 It's a wonderful resource and is proving to be a valuable tool for learning about bird migration and populations. 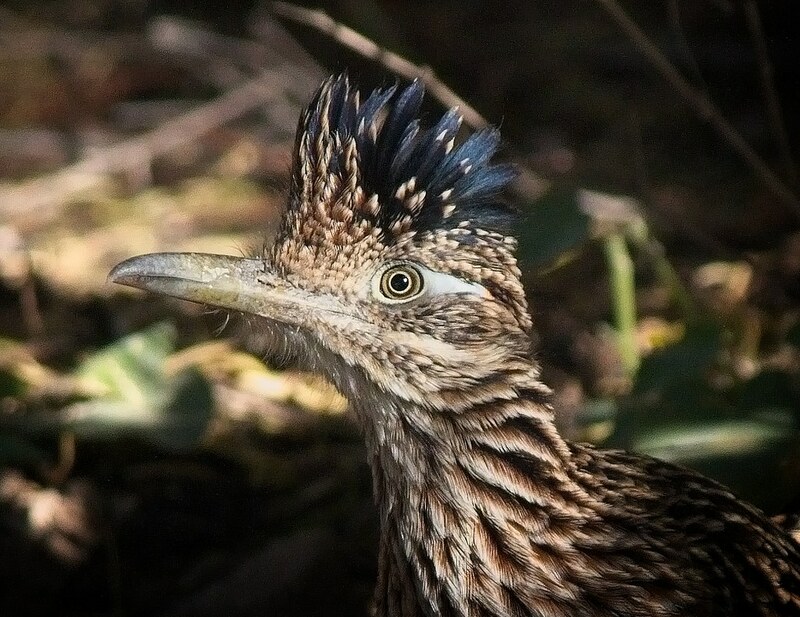 This illustrated eBird list contains photos of many of the birds observed on the island. For anyone interested in visiting Governors Island, it is currently closed for the winter, but will be open to the public again on May 1. You can learn more about the island on its website. One reason I like to visit Governors Island is it is a great place to see wildlife in a more "natural" environment within an urban area. Kestrels live in the city, often nesting in the cornices of tenement buildings. When I've seen them hunt for food, they usually get sparrows or raid other bird nests. Governors Island provides an opportunity to see them behave more as they would in the wild, hunting large insects in an open grassy area. This female kestrel is one of two who spent several weeks on the island. 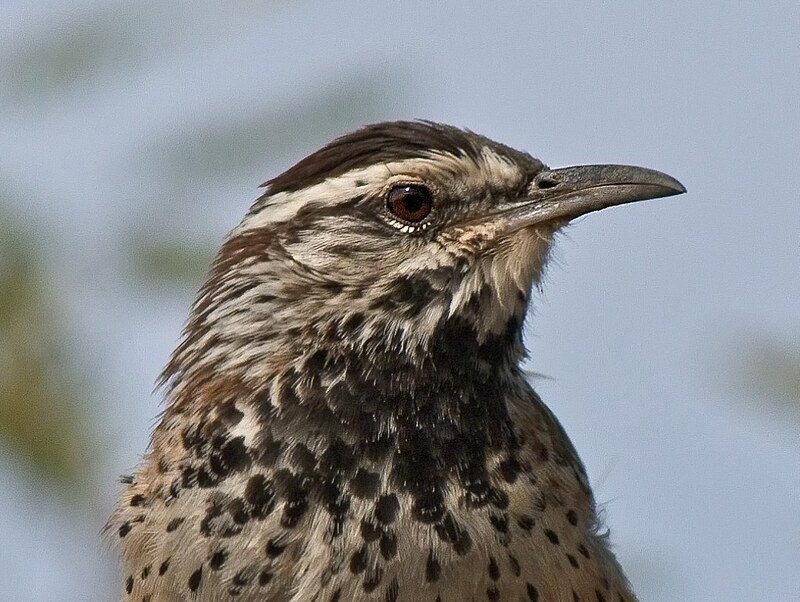 She has a notably white chest with well-defined brown streaks. I watched her one afternoon as she hunted for prey at Hammock Grove, a hill in the middle of the island with a lot of low and dense vegitation. She would perch on a tree (as above) or a pole (see below) and dive into the bushes and grab grasshoppers, cicadas and praying mantises. Fort Jay is a unique feature on the north side of the island. It's surrounded by a moat that is filled with grass rather than water. The grassy moat is a fantastic place to see kestrels and other birds hunt insects. The predators perch on the walls of the fort and dive down into the moat and scoop up food. In addition to kestrels, I watched flickers, phoebes, palm warblers, yellow-rumped warblers, cedar waxwings, mockingbirds, starlings, mourning doves, and even hawks hunt in the moat. Below is the second female kestrel who spent a great deal of time on the island. 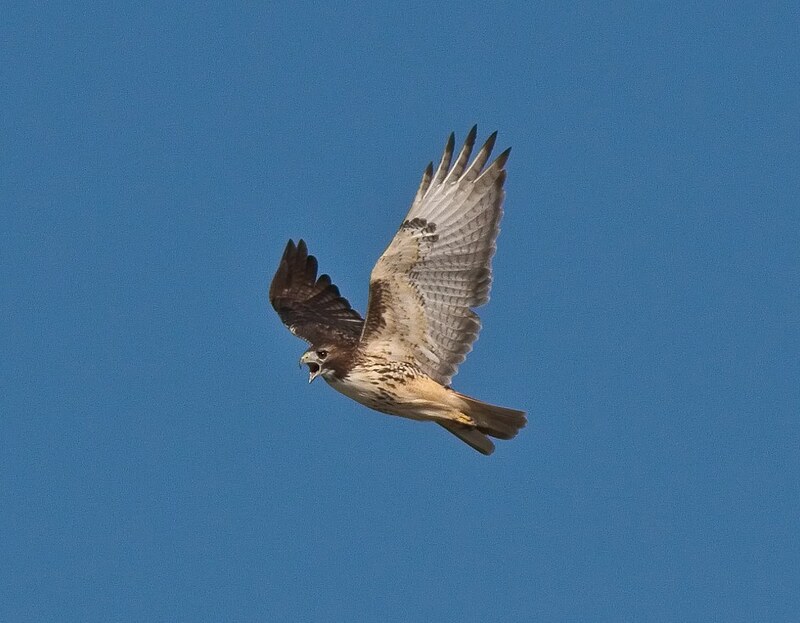 Compared to the kestrel above, this one has a more mottled buffy brown chest. She's carrying a sparrow. The two female kestrels dominated the area around the fort and I often saw them together, although I don't know the nature of their relationship. 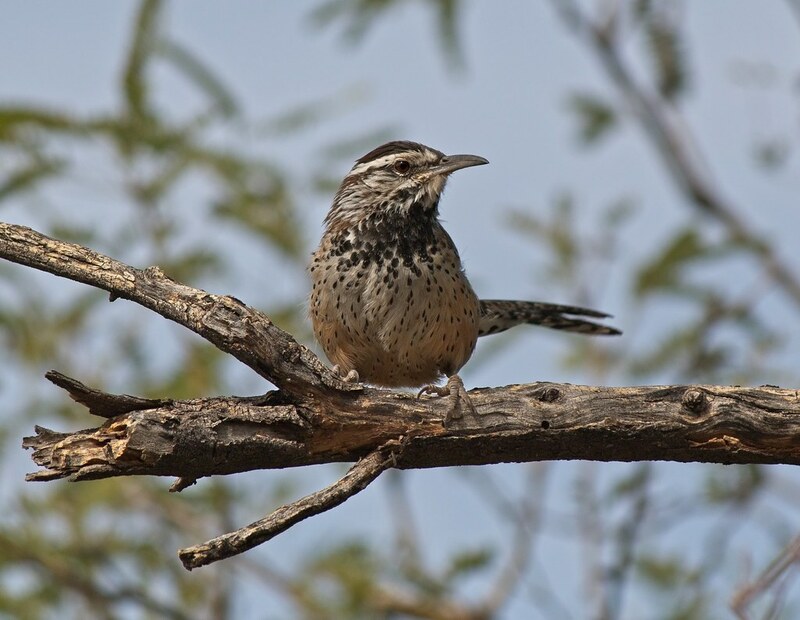 In October, a beautiful male spent some time on the island and he put on a fabulous show of hunting insects on the slope of Discovery Hill on the south side of the island. Like the previous female, the male would perch on a post and dive into the vegetation to catch large insects. Below, he clutches a praying mantis. Below, the same male goes after a cricket on the pavement along the water's edge. ...then poses for the camera with his trophy. This is the same male with Jersey City in the background. Kestrels were not the only falcons present on the island this last season. One afternoon, I was lucky enough to come across a merlin who was just chilling out on a wood pile. I had just been watching a male kestrel harass a red-tailed hawk atop a building in the middle of the island about ten minutes before. To my surprise, the same kestrel appeared as I was watching the merlin. As if that wasn't exciting enough, the two falcons then did an astonishing thing - they quietly hung out together! In the photo below, the kestrel is perched on the branch and the merlin is down to the left on the ground. They stayed in this position for several minutes before the kestrel flew down to the ground to join the merlin and they both disappeared behind the pile of debris. What were they up to? Neither the kestrel nor the merlin ever made a sound, they just calmly walked off together. I couldn't get a better view as I was trapped behind a fence, so what these two got up to behind the debris pile remains a mystery. I took some video that shows the both of them together. 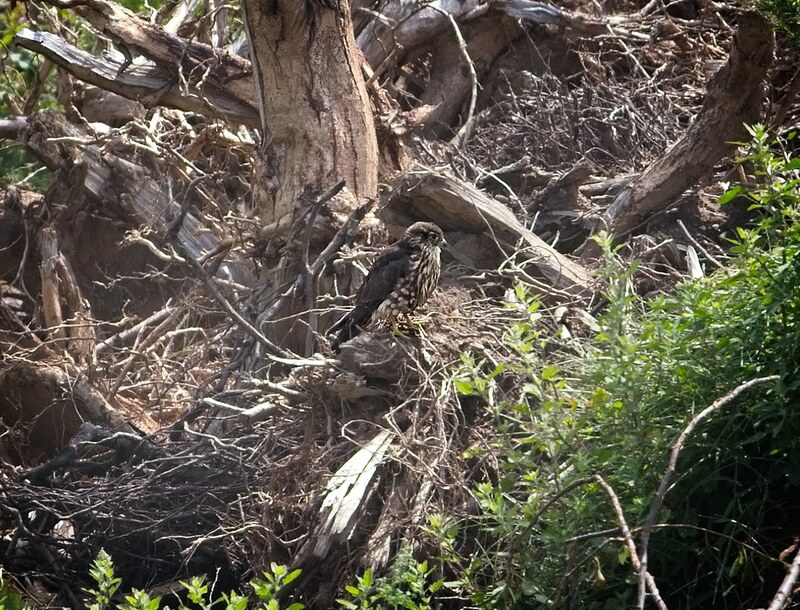 I was originally filming the merlin and, just as I panned out with the camera, the kestrel flew in and perched on the wood pile, so I tried to quickly zoom back in. At the 1:47 mark, you can see the kestrel perched on a branch to the right. 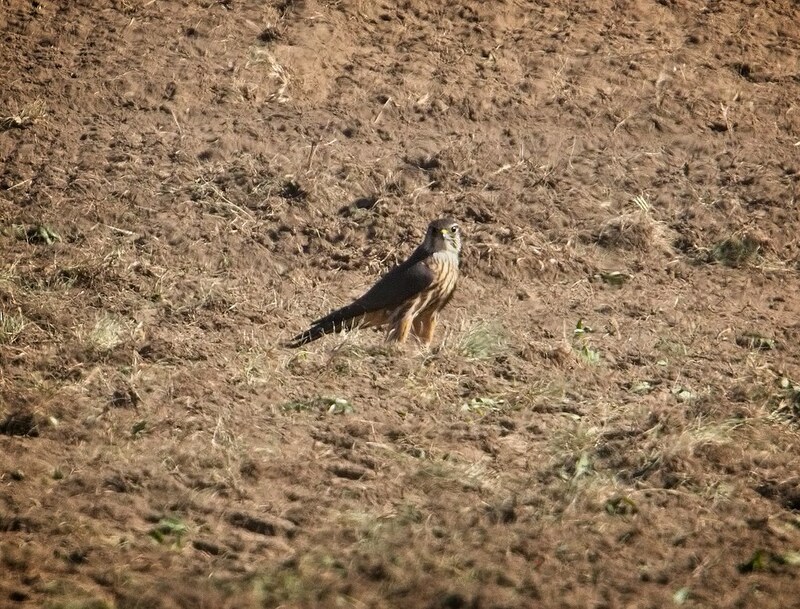 About a month later, another merlin appeared, just standing in the middle of a patch of tilled dirt on the south side of Fort Jay. This particular patch of dirt proved to be an extremely active area for birds. On this day, along with the merlin, sixteen flickers, four hermit thrushes, several palm warblers and the two female kestrels were all going after insects on the ground in this one spot. The tilled dirt was in preparation for new sod. Most of the Parade Ground has brand new grass, which is lovely for people to sit on, but the old grass, which contained clover, dandelions and other wildflowers, supported a lot of bees, butterflies and other insects. This made it attractive to the birds. As the old grass was replaced with new sod, all the bird activity stayed on the progressively shrinking patches of old grass, while the areas of new sod appeared lifeless except for a few squirrels. Below, one of the female kestrels flies past a squirrel on the new sod. Here she goes again, in the last light of the day. It will be interesting to see if the new grass supports more wildlife next season. 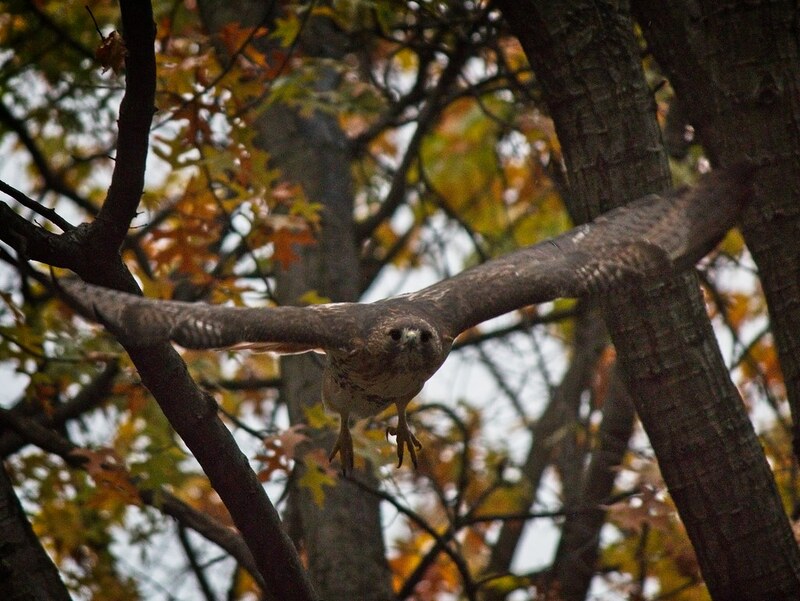 Stay tuned for the final installment in the Governors Island series, which will feature hawks. 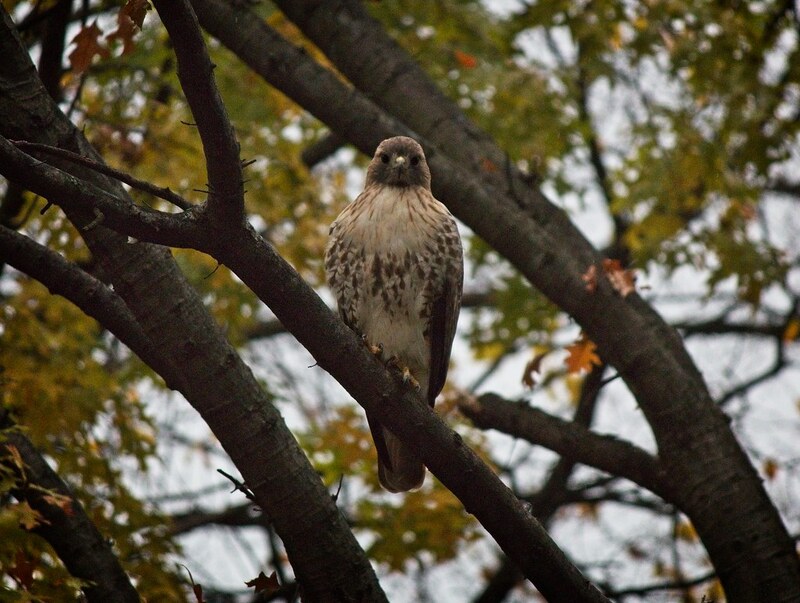 For more photos of falcons on Governors Island, see my Flickr page.